Pest, weed and fungal management are three components that are linked by timing. If the weeds get out of control it limits airflow underneath the vines creating a potential for fungal diseases to develop on the foliage and gives pests like leafhoppers a place to start their life cycle. So by timing our mowing and spraying movements through the vineyard blocks we try to minimize our passes through the rows. We are currently switching from conventional herbicide use to under row cultivation to better incorporate our composts and stop acidifying our soils. This results in creating a soil that has a better water holding capacity and will lead to less water use during the growing season. As part of our fungal management program we are true believers that it is better to prevent than to cure. By preventing we are able to use soft sprays like sulphur, natural oils, bacterial sprays and copper over chemical sprays. The amounts we use and frequency all come down to predicting disease pressure by using several models and years of experience growing grapes. All our vineyards have drip irrigation for the vines and either overhead or under vine spinners to water the covercrops. Drip irrigation is used all season long for the vines and occasionally we use the overheads to cool down the vine canopy on scorching days preventing the vines from shutting down and the fruit maturing. The goal in the end is to have a healthy balanced vineyard, producing premium fruit with minimal chemical intervention. Leaving a farm that is self-nourishing and healthy for our workers to work in. The saying that wines are made in the vineyard is a saying that Little Engine truly believes in. Bad or mediocre grapes will never make a great bottle of wine. Grapes can become ‘good’ with lots of intervention during the winemaking process, but why bother if all it takes is healthy vines producing premium grapes resulting in premium wines with minimal intervention in the winery. 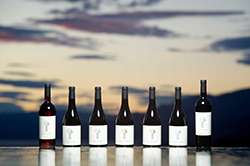 With a belief that the best quality wine starts in the vineyard, Little Engine uses several sustainable practices in the vineyard that continue the commitment to creating the smallest “footprint” possible and leave the land in a better state than when we started farming it. 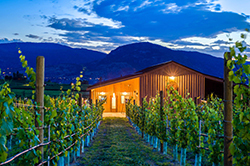 The overall goal for our viticulture team is to produce the highest quality fruit possible on the Naramata Bench. It all starts with the soil. A living soil is a soil that can withstand compaction and erosion and still nourishes the vines with adequate nutrients when the plants need it. Our practices include cover cropping with nitrogen fixing mustards and clovers and incorporating these into the soil. Besides plant based materials we use composted manures and use the pomace from the winemaking process to give back the nutrients to the vines we have taken out by harvesting the grapes. Fish and kelp fertilizers and humic acid are also used by fertigation to keep the tractor movements to a minimum. All these practices add organic matter to the soil which contains many strains of microbes, both bacterial and fungal which in turn creates a soil that is self-nourishing without the need for chemical fertilizers. All our canopy work, besides hedging, is done by hand. This goes from planting to harvest including, pruning, de-suckering, bud thinning, shoot positioning, fruit selection and netting the fruit for predatory protection. By spending so many hours with the vines we understand each little nuance and difference in each row, making picking decisions on a half panel basis possible. No fruit gets picked till its optimal ripeness.